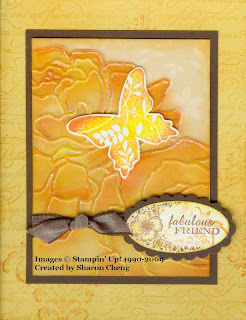 I wanted to use several of my new toys from Stampin' Up! and this is the card I ended up making. It uses the Manhattan Flower Texturized Impressions Die, Great Friends, Oval All and the Scallop Oval Punch. You can barely see the Walk in the Park Designer Series paper behind the Vellum cardstock. With the Get Connected promotion, when you purchase $40 from the Occasions mini catalog, you can select one item from the under $10 group on page 208. Check out the promotion details on my website.